The College has not received sufficient interest to offer the 2016 Italy Study Tour and therefore has decided to cancel the tour. A full update is available in our newsletter, Communiqué. In September 2015, health leaders from Canada travelled to Italy for prearranged meetings with 8 healthcare organizations that represented both public and private institutions from the different regions of Italy. These meetings were arranged in cooperation with the Canadian College of Healthcare Leaders, and the Italian Chambers of Commerce of Ontario. We also thank the Italian Association of Private Operators (young division) for their assistance. The study tour participants were senior leaders from Ontario from various health sectors including acute care, complex continuing care, and private industry. The study tour was 5 days in length and included site visits to several public and private hospitals, a pediatric hospital, a complex continuing care/long-term care hospital, and a health research institute. Sites were located in cities of Rome, Florence, and Bologna. Participants extensively toured these healthcare organizations and attended presentations by leadership of these organizations. Sean Gehring is the Manager of Specialized and Neuromuscular Care Streams and the Manager of International Business Development with The Ottawa Hospital. Sean is the recipient of the 2014 Emerging Health Leader Scholarship , sponsored by Aramark Healthcare and was invited to participate on the Italy Study Tour, which was held from September 14 -20, 2014. The study tour brought together a small group of Canadian healthcare leaders to explore current developments in health services policy and organization in the Italian health systems. The tour provided a rich forum for the exchange of information, ideas and experiences between the Canadians and their Italian counterparts. 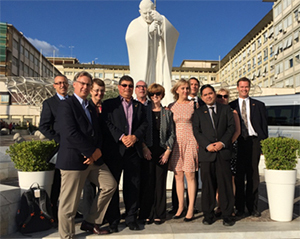 In October 2013, 13 senior health leaders participated in the first Canadian College of Health Leaders (CCHL) Italy study tour. Being the first tour in Italy, the CCHL planning team engaged the Italian Chamber of Commerce to create a study tour itinerary that would provide participants with a rich learning experience. For more information on Study Tours, please contact Francine St-Martin, Conference Services at fst-martin@cchl-ccls.ca or 613-235-7218 / 1-800-363-9056 ext. 212.